Do you ever cringe when you receive an email, a leaflet or a letter or you’re reading a magazine or book and you notice there are grammatical and spelling errors? A mistake tends to stand out like the proverbial “sore thumb” and a glaring error or two may spoil an otherwise excellent article. Several errors may even cause you to stop reading altogether. Have you ever spent a lot of money on a brochure and found there is a “howler” on the Introductory page or perhaps invested in having 5,000 flyers printed to find it has the wrong information, perhaps an incorrect address or even the wrong date. Do you wonder how the writer, the designer or the printer has not spotted these typos? It’s probably because it’s not their job! Perhaps, your writer was thinking just about word count and content and presuming somebody else would be proofreading the article. The designer has used the words to create an attractive design, and the printer has checked quality, layout and colours. They might have picked up a few things, but, ultimately, the poor quality of your copy will detract from the overall good quality of your brochure or flyer. So, how can this happen? Today, it should be straightforward to write perfectly as many programmes have spell checking functionality and these should spot spelling errors and wayward grammar! However, beware! Spell checkers won’t spot words that have been incorrectly used if they are spelt correctly. A text free of errors is essential to make a good impression. Before you send anything, make sure that it’s well written and free from mistakes including spelling, vocabulary, punctuation, grammar and English usage. Remember, this may be your first contact with a potential client, a potential employer or an examiner and it’s vital to make it count. If you are checking your own work, make sure you don’t miss an error. You may think it’s not critical but a misplaced comma can dramatically alter the meaning of a sentence and may not convey the message as you are intending. Why do we miss mistakes? So, why do you not notice mistakes when proofreading? It can be because there are too many distractions around you, the music may be cranked up or you are intermittently talking to people. It may be through a lack of time or it could be that your grammar, punctuation and use of the English language are not quite perfect. To write our own articles uses a lot of brainpower but a lot less is used when you read other peoples’ work. When you’re proofreading your own work, you know the meaning you want to convey and you expect that meaning to be there. This is why it’s easy to miss mistakes as you expect words and letters to be there. The reason we don’t see our own typos is because what we see on the screen is competing with the version that exists in our heads. When you’re proofreading, you are trying to trick your brain into pretending that it’s reading the thing for the first time. Stafford suggests that if you want to catch your own errors, you should try to make your work as unfamiliar as possible. Change the font or background colour, or print it out and edit by hand. “Once you’ve learned something in a particular way, it’s hard to see the details without changing the visual form,” he said. You can become blind to details because your brain is operating on instinct. By the time you proofread your own work, your brain already knows what it is expecting to see and read. This explains why your readers are more likely to pick up on your errors. Even if you are using words and concepts that your readers are familiar with, their brains are on this journey for the first time, so they are paying more attention to the details along the way. 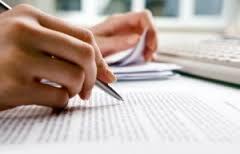 A professional proofreader will polish your copy so the final product is well-written, precise, and easy to read, leaving your readers with a memorable and lasting impression of your work. Mistakes will undermine your article and can cause the reader to switch off. Proofreading is an acquired skill and proofreaders are specifically trained and experienced at finding errors in a text. Proofreading is an essential part of the writing process. Be wary of proofreading your own articles, as fresh eyes are more likely to pick up on mistakes.